A memory popped up on Facebook the other day revealing that by the end of November 2012, I had completed twelve sweaters for the year. Those days are long gone, but I still knit! However, this is only my second sweater for 2017. This one could not be more timely. We woke this morning to 50 degrees and rain. We have lows in the mid-thirties later this week. 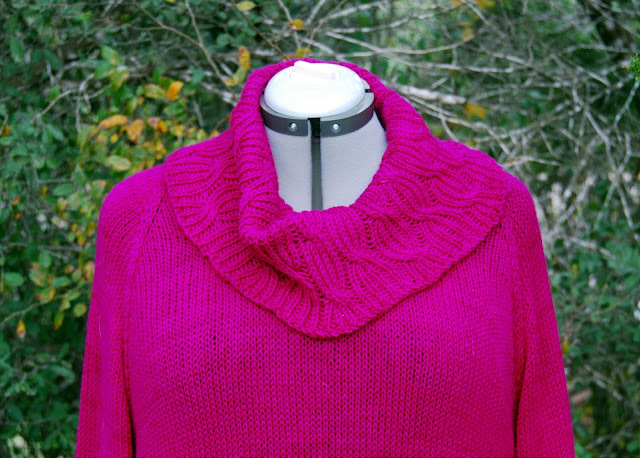 Yarn: The instructions call for a worsted weight, but I did not want such a heavy sweater, so I went with Wollmeise DK in Fuchsia. It is something of a loose weave, which grew a bit after soaking and blocking, but it has a wonderful feel to it. The pattern was well written and very easy to follow. If I had been a monogamous knitter, this would have taken about three weeks to do. Hard to believe, but 20 days until Christmas!